The division is expecting 5% to 6% growth by eliminating 450,000 unproductive house calls. There hasn’t been a lot of good news about Sears Holdings in recent years, but a divisional finance chief for the owner of Sears and Kmart showed up at a CFO conference last month to present a success story about its use of data analytics. One thing the company still has going for it is bulk. It’s been shrinking recently, but 2014 revenue still topped $31 billion. That equates to a large mountain of customer data available for analysis. As a stand-alone company, Sears Home Appliances and Services would be comfortably within the Fortune 500 itself, with revenue of $8 billion. Brian Kaner, who spoke at CFO Rising East in Miami, came aboard as the unit’s CFO at the beginning of last year from Stanley Black & Decker, where he’d been a divisional CFO and business-unit president since 2006. 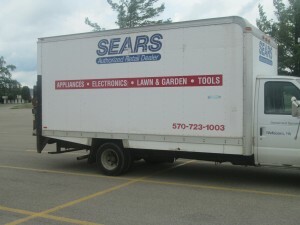 A key challenge for Kaner from the outset at Sears was to wring out cost and elevate productivity within the division’s $3 billion home services operation, which he said performs 8 million of the 22 million appliance repairs that take place annually in the United States. Sears’ appliance-repair trucks carry about 400 parts, which Kaner said is sufficient to complete 70% of repairs on the first visit to a home. The 30% of service requests that take multiple visits to complete may sound like a lot, but according to Kaner it’s an industry-wide issue. Even to reach a 75% first-time success rate would require carrying 8,000 parts, he said, and 175,000 parts would be needed to complete all repairs the first time out. Kaner set in motion a plan to use data analysis as a key tool to accomplish a goal of completing 95% of repair calls within five days of the service request. “We found that there actually was a way to get there, but not by determining what 400 parts are always going to be needed,” he told the crowd of finance executives. The final key was to then send that part to the person’s home in advance of the service call. “The way you grow a service business is to free up capacity and not run unproductive calls, saving that capacity to run the next productive call,” he said. “In our case that growth was roughly 450,000 calls. So we could grow the business by 5% to 6% just by taking out the unproductive pieces.” The division hasn’t yet eliminated that many calls but expects to based on its data analysis. Kaner offered some advice for his peers about making data analysis useful. First, get help. Hire a data scientist or a consultant to work with people within the company to build the needed IT infrastructure, organize the available data, determine what data are and aren’t useful, and test algorithms to see if the analytics is predicting the right answers. “You can’t just take mountains of this information and start building pivot tables to do all this stuff,” he said. Sears used a consultant and, given the value that was generated, is now looking to hire an on-staff person. Photo: Random Retail, CC BY 2.0. The image is unaltered from the original. I have been a Sears customer for decades . There use of outside contractors can have a serious negative impact on customer satisfaction .